Vivian’s parents have joined thousands of others in the Church of America worshipping to a guy with the name Frick who believes the rapture is coming. After attending a rapture party and nothing happening Vivian returns home the next morning to find her parent’s missing and two holes in their bedroom roof. They aren’t the only ones either. 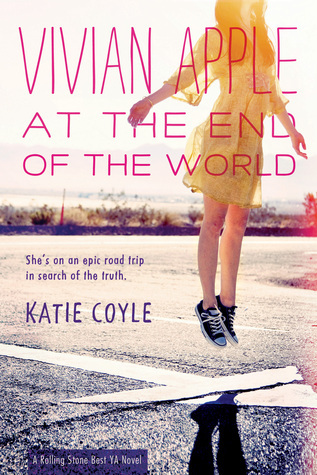 She decides along with her best friend to take a car trip across the country to California and try to get some answers. This was an interesting idea book and an easy read for the most part. But in the end I came away not liking it mostly because I couldn’t believe it. I mean call me hopeful but I just couldn’t believe that people would be so dumb or that no one in the country (and the biggest number given for the disappearances is 3,000 so there’s plenty of people left in the country) wouldn’t look into this mystery. Okay there’s some other stuff going on- mostly strange weather problems and violence breaking out but still you’d think someone besides Vivian would say hey, what’s really behind all this? To get to deep into why I didn’t really like the book would be to give out spoilers but Vivian misses some pretty big stuff about her family particularly her mother so again I find it hard to believe she’d be the one to pick up on and unravel this mystery. It didn’t hold up. For that matter Vivian rightly wants to find out what happened to her parent’s but the impression they left me with even through her memories was that she might be better off without them. Nothing. They don’t go to the cops. They don’t go to the FBI. They don’t go to the media. (And really you’d think the media would be all over this.) They’re just like huh, really hope he’s okay and we see him again. Let’s just continue on with what we want to do. Some friends. That just bugged me way too much and brought the characters down in my opinion. Recommend: Too many problems including some serious plot holes. Book two of this series is already out (because everything has to be a series these days.) I am a little interested in the fate of the friend they left behind but I’ll probably just check out spoilers and reviews instead of reading it.